Grape seed oil was once the well-kept secret of many traditional cosmetic repertoires. It's an easily absorbed, gentle oil that is light on the skin. Known in the cosmetics industry as a carrier oil, grape seed oil facilitates a wide array of commercially available creams and lotions. While you may have no qualms about paying for high-priced cosmetics, you could easily apply the lotion directly from the bottle to enjoy its soothing benefits. It's no secret as to why cosmetic companies prefer to use grape seed oil as a base for their assorted creams, lotions, and ointments. In addition to an ideal viscosity, the oil is extremely rich in beta-carotene and vitamins D, C, E. It also happens to have a concentration of essential fatty acids like palmitic, stearic, and linoleic acid. These fatty acids have performed well in clinical anti-wrinkle trials. They have also proven to be effective at minimizing the prominence and size of scars. Nutrient-rich grape seed oil has found its way into myriad cosmetic products, especially products meant for the face and hair. Lip balms, face creams, conditioners, moisturizers and other products that contain grape seed oil are all rich in polyphenols. These polyphenols are anti-inflammatory antioxidants known to retard the aging process and prevent acne outbreaks. Consequently, a number of acne creams and toners use grape seed oil as a carrier oil. 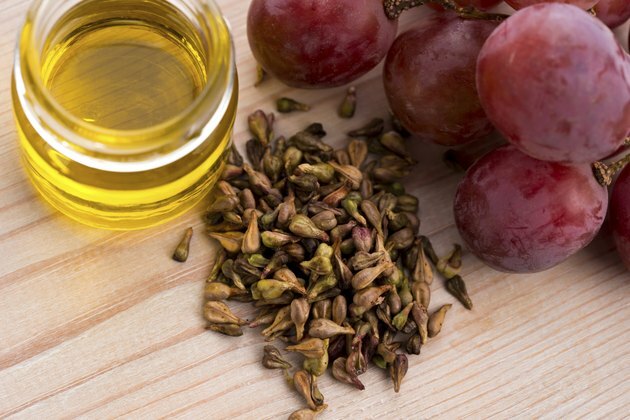 While it may seem counter-intuitive to use an oil to treat oily skin, that is exactly what grape seed oil is used for. The last thing you want to do with oily skin is dry it out. In fact, that oiliness is a reaction of skin that is too dry. Grape seed oil is light to the touch and never leaves skin feeling heavy with oil. Instead, it effectively moisturizes the skin, balancing both dry and oily patches. When used as a toner, grape seed oil can penetrate blocked pores and cleanse breakouts. Biochemical research into grape seed oil has found it is rich in oligomeric proanthocyanidins. Otherwise known by the acronym OPC, these flavonoids remove free radicals and promote the restoration of collagen at the cellular level, making your skin feel more firm and minimizing more signs of damage. On a tangible level, this contributes to keeping your face smooth to the touch and youthful in appearance. Again, this is the key contribution of grape see oil as far as the face is concerned.